“A huge amount of work has taken place to shape a viable development plan that meets the aspirations of local people expressed at an earlier public consultation event. The regeneration will bring a whole new dimension to the town centre – with a unique mix of uses that will create new jobs and add to the wider East Ayrshire and Scottish economies. The innovative regeneration scheme is being driven by The HALO Kilmarnock Ltd, formed by The Klin Group and Ross Developments and Renewables of Glasgow. Diageo PLC and East Ayrshire Council have each pledged £2million to the re-generation of this important town centre site. The HALO is being shaped as a multi-faceted brown-field regeneration that will create an innovative inspirational and imaginative urban park – with a surf pool – and a dynamic commercial, educational, cultural, leisure and lifestyle quarter, with a renewable energy-powered low carbon district heating network which will address fuel costs on the site and have the capability of being extended to other areas of the community. The development will also include a light manufacturing facility and key worker private rental accommodation. 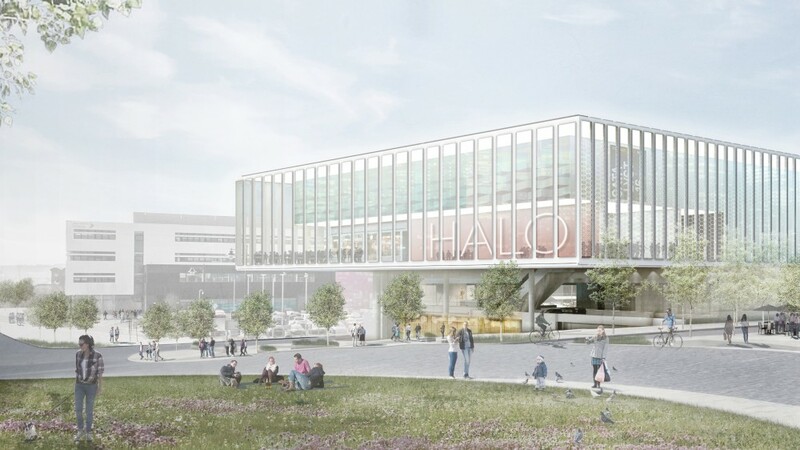 The proposals for The HALO which will centre on a new Urban Park, will foster businesses in engineering, manufacturing and textiles, with a focus on innovation and enterprise. It is proposed that the development will provide exhibition space and a year round leisure and water sports facility centred on its wave/surf pool, as well as local shops.